Lock Dawg offers high-quality key duplication services for cars, homes, businesses, motorcycles, RVs, boats, file cabinets, and more. Lock Dawg offers quick and convenient locksmith service that caters to the Central & Northeast Georgia region. We specialize in key duplication as well as other locksmith services like auto locksmith and emergency service. If you need an efficient locksmith, our professional can do the job. If you need fast key duplication, contact Lock Dawg for our affordable prices and certified locksmiths. Lock Dawg offers high-quality key duplication services. We make keys for cars, house keys, RVs, boats, and more. If you need file cabinet keys, desk keys, or any other standard key, we are the key maker you’re looking for. We can also provide transponder keys and high-security keys. If you break your car key in your vehicle’s ignition, call our emergency service. We can extract the key from the ignition then make you a new key. We know that emergencies never seem to happen during our normal business hours, so we’ll be there when you need us. Aside from key cutter service, Lock Dawg specializes in a wide array of related services. We can also help you when you’re locked out of your car or home by picking the lock, damage free. Need your cars locks worked on? We can perform ignition lock replacement, trunk lock repairs, and program car remotes. Whether you need a new transponder key or a high-security key, Lock Dawg can handle the job. All of our locksmiths are fully licensed and insured to perform any automotive, residential, or commercial locksmith service. We take our all our jobs seriously and work hard to provide outstanding customer service. Never trust your locks or keys to anyone except for a professional locksmith. There are many technicians who say they have the experience and skills to repair locks or replace keys, but unlike us, they don’t have the credentials to back it up. Lock Dawg locksmiths do have the credentials and loads of experience servicing homes, businesses, autos, and more. If you need key duplication service or lock repair, Lock Dawg locksmiths can provide you with affordable and fast service. 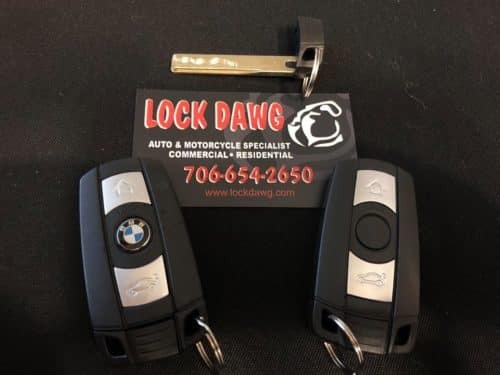 When you contract with Lock Dawg, you can count on us to be at your Northeast Georgia location when you need us. Just call us and tell us the problem. We can often provide you with a quote right over the phone. If you need a professional mobile locksmith, we’ll send one out to help. We’ll bring along whatever’s needed to complete the task. For key duplication and a full spectrum of locksmith services, contact Lock Dawg. We look forward to providing you with the best possible service.